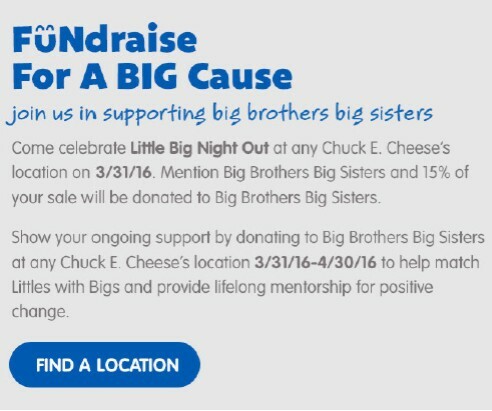 Chuck E. Cheese’s is ramping up for National Volunteer Month (April) with a nationwide fundraiser for Big Brothers Big Sisters. I can remember my dad being a big brother to a little boy when I was growing up and thought it was awesome. So this is already on my calendar of events to attend! This event gives us parents the perfect opportunity to talk to our kids about giving back in a way that isn’t too jarring or confusing. It’s easy to talk about how BBBS matches kids (who might be having a hard time) with really nice, smart grown-ups to help them make good choices. So make sure you mark your calendars for March 31st and visit your local Chuck E. Cheese’s between 3-9PM and show your support! 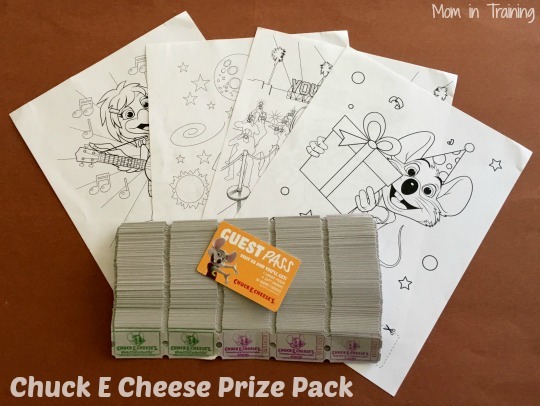 Win it: One lucky reader will win a guest pass (good for 1 large pizza, 4 fountain drinks and 30 tokens) + 1,000 tickets. This giveaway will end April 8th at 11:59 PM EST. The winner will have 24 hours to respond to my email. If no response, a new winner will be chosen. Prize fulfillment will be made by the sponsor, I am not responsible for prize delivery or lost or stolen deliveries. Open to residents of the US. christmas and halloween. give out alot. We volunteer as a family at a local organization that helps foster kids and families! My daughter was taught at a young age to reach out to those that need help. She was the top fundraiser for a kids cancer research walk, she has done a lot of fundraiser walks, she is 10 and in 5th grade and volunteers her recess 3-4 days a week to go down and play with the special needs kids and has done so since she was in third grade. We try to show our kids what it means to give back by actually doing it. If we model for them and let them experience the joy that it brings, we hope to encourage them to do it more often and on their own. My sons enjoy volunteering at our local nursing home. They are "grandkids" to many. I would teach my kids how to give back to others by showing them how to donate and give to charities. My daughter is only two, but I've had her give dollars and change to charities. We've also had her pick out toys to donate. We can hopefully do more things in the future as she gets older! It is hard with my son for he has autism but I try to teach him to donate to the food shelf and to help others. They help out at our church's food kitchen. We donate to thrift stores. I try to always let my son know how blessed we are and can always share or give back with those less fortunate. We volunteer as a family at food banks, etc. I talk to them about helping others and they see me giving to charity. We donate clothes and food several times a year to our church and local shelter. I have taken my son to the Ronald McDonald to volunteer & we go thru his things to give to Goodwill. We also pay it forward. I make sure to regularly talk about how others might be in need and then together think how we can help. Then, actually do what we can for them. We donate to the local food bank. My children will purchase items,using a portion of their allowance. We go through our things and donate on a regular basis. We try to volunteer at community events as much as possible. We teach them by donating clothes, toys, and food to our local shelters. we volunteer at our church all the time and take them with us to help! We volunteer at a food pantry and they give toys every Christmas. We help our community by donating food and clothing. Just yesterday at a community Easter Egg hunt, I helped my grandson look for kids that didn't get any eggs and he shared his with them. That made him feel good, and hopefully will make him think about those less fortunate than him in other instances too. We are always donating and make sure we give back. I lead by example. I always show them how important it is to give back. They sort through their good, nice and clean toys that are like brand new and give to kids that don't get to enjoy nice toys like those. We donate toys and clothing to our local Salvation Army and Planet Aid. When we go for bike rides, we pick up any trash we see. I have my daughter volunteer. We bring food to our local food pantry. We donate clothes and food to people in need! For now he donates old toys and clothes. He is also very good with sharing with others. The kids always help with donating food and also go through their clothes and toys to donate to local organizations. We teach our kids to give back by modeling it for them. We want them to experience the joy it brings so we plan for family events where we give back like feeding homeless, volunteering, etc..
We donate clothes and toys to shelters. We like to volunteer together as a family. We teach our children about giving back by having them clean out their rooms every few months and donating the items to our local shelter. I try to find creative ways to give back. Last fall we were able to take my 3 year old to an animal shelter to donate some supplies for them and then he got to see all the animals he was helping. I teach my son to give back by bringing him with me when I volunteer. He is so inquisitive and I always answer his questions. My oldest has gone to the homeless shelter to help with food pass out and my youngest learns by giving her old toys away to charity. We work on giving back together and always donate our gently used items. We try to lead by example. We love letting him pick out toys during Christmas to give kids who might not have much for the holidays! I encourage my kids to donate old (but good) toys and clothing. I teach them by leading by example. by volunteering and donating items. My oldest daughter just turned 2, so she doesn't quite understand the concept just yet but she loves to share with her younger sister. We are trying to start early to make it a habit, we tell her as we go through her toys that they are going to help another little boy or girl & she helps choose what to share with them. I teach my kids by donating food and clothes throughout the year. i teach by example, i love to give it is very important. We volunteer and donate often!! We donate clothes, toys, and food. I teach the kids to give back by helping the neighbors and donating their time to help others. My children volunteer to help distribute food to the needy. I teach my daughter to give back by donating unplayed with toys to kids that have nothing. We donate canned foods to our local food pantry, this helps them learn the value of helping others in our community. I show them by example. If they see me and others around them giving, they will see the benefits of it! Thank you!! She knows the importance of giving back through examples we've taught her. For birthdays, my daughter asks for items to donate to the local animal shelter instead of gifts for herself. She learns that it feels great to help others, to do good. Better than any gift can make her feel. We volunteer at our food shelter and we also have a fund raiser that we do every year that the whole family is involved in. They do volunteer work and fundraisers for local groups. We teach humility, volunteer as a family, donate to good causes, and set good examples for our children by giving back to others ourselves. We teach by donating to local charities!! We teach them by example like adopting families for Christmas as well as volunteering at our local homeless shelter. they learn through me, I am the giver. I have my grandkids go through their belongings and clothing that no longer fits them and we take these items to donate to various local organizations. We also participate in donating food. I teach my kids to give back by donating their unwanted items. Unfortunately we don't have any children of our own yet, but I always try to show my nieces that they need to be kind to others. I'm sure they would love a visit to Chuck E. Cheese. We teach my nephew about sharing. He's very young, but I look forward to teaching him about giving back to others. We like to donate toys and clothing to children who are less fortunate. From the minute my children could understand, I explained how blessed we were at that most of the world goes to bed hungry. I teach them not to waste food by taking small portions and they can help themselves to more later if they want. We donate money and food to food banks. Poverty is really bad in my state (California) we are #49 in the U.S.
My daughter and I each year go to "Clean the world." It's an organization that takes used and new soap and bath products and sanitizes them and together we put together packages of those products to go to homeless and people who go through catastrophes. We also include a sweet note in there for them. It's a great charity and it's awesome to do it here in Las Vegas, where the hotels contribute all their used and new bath products too! We both love it, and feel great giving back. Be kind to all, donate your time when you can, money if you're able and clothes you no longer need. Each Christmas my daughter heads to the nursing home to sing Christmas Carols with some friends and in the spring we clear out toys and clothing that we donate to a local place! We donate toys and money to the Salvation Army at Christmas. I taught my son to treat others as he would want to be treated! We don't really do anything super special to give back I just make sure they are kind and do good when they see simple ways that they can such as holding a door open for someone or picking up trash that someone has thrown on the ground. Simple things like that. We volunteer at least once a week. I like to have other children with us so it is a fun group activity and they do not feel that is a Chore they have to do.